This Amelia Island Concours d’Elegance will go down in history as the first time the Concours was moved from Sunday to Saturday to avoid inclement weather. This meant that the entire weekend of events was condensed into two days. 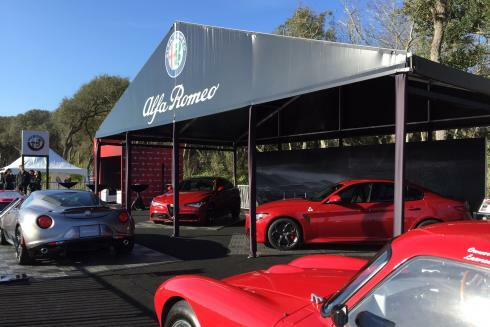 Even with these constraints, the Centigrade team assisted the Alfa Romeo brand in performing 130 test drives and engaging with more than 840 guests. Alfa Romeo’s display on the Concours show field featured a coffee bar and sound lounge along with the new 4C Coupe, Giulia Ti, and Giulia Quadrifoglio and two historic vehicles. Guests were introduced to the vehicles by four product specialists and some even had the opportunity to see Ralph Gilles, FCA’s Global Head of Design and Pieter Hogeveen, Director of the Alfa Romeo brand in North America, perform a product walk-around. Centigrade also scheduled and managed test drives from the front of The Ritz-Carlton. The program ran smoothly in the face of challenges that Saturday’s increased event attendance posed to Alfa Romeo and all other brands present. For this reason, all guests left the Giulia Test Drive Experience with a smile on their face. We would like to thank everyone who, in spite of unforeseen challenges, contributed to making this event a success.